The first Poster Monday spot of the days belongs to Augusto Zambonato, a Brazilian Graphic Design student born in 1991 in Santa Maria,Rio Grande do Sul. Augusto is currently taking a non degree exchange program at the Savannah College of Art and Design (SCAD) studying Illustration and Graphic Design. He has always been interested in the power of visual communication and the possibility of a communication that exceed the language barriers using images. He finds inspiration in posters with bold images, that has the capability to communicate strong messages with just a single image or almost no text. “The poster “Think for yourself” frames an interpretation of the dependence and addiction on internet, social media and technology as a whole. 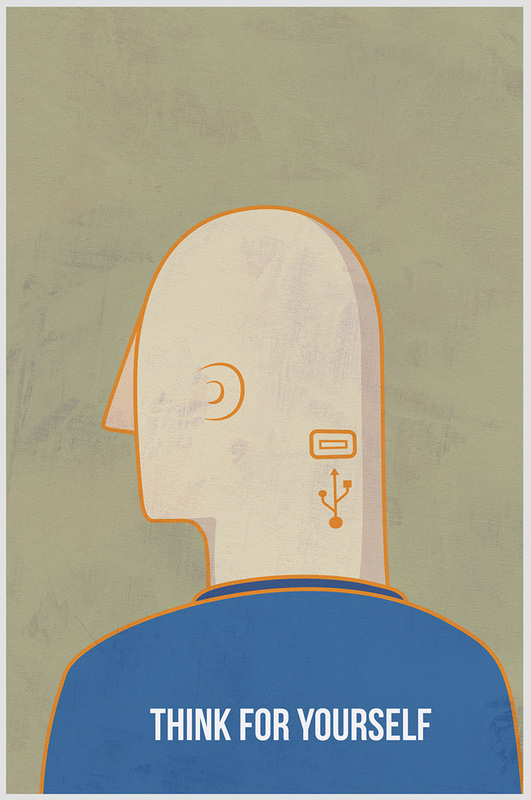 The man with the USB port represents the contemporary people, totally integrated with the digital technology, but also dependent of it, and ignorant of this dependence.” says Augusto. The poster was designed to raise awareness on this situation and to stimulate people to at least try to change it. “Think for yourself” belongs to a series of three posters, about the internet/digital addiction and its dependence nowadays. Visit Ausgusto’s behance page to learn more about him and his personal projects.